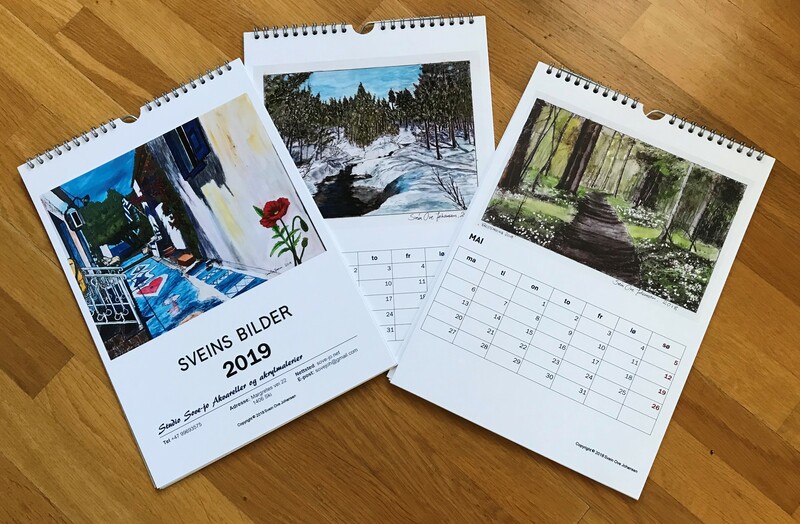 These are my paintings made during 2018. 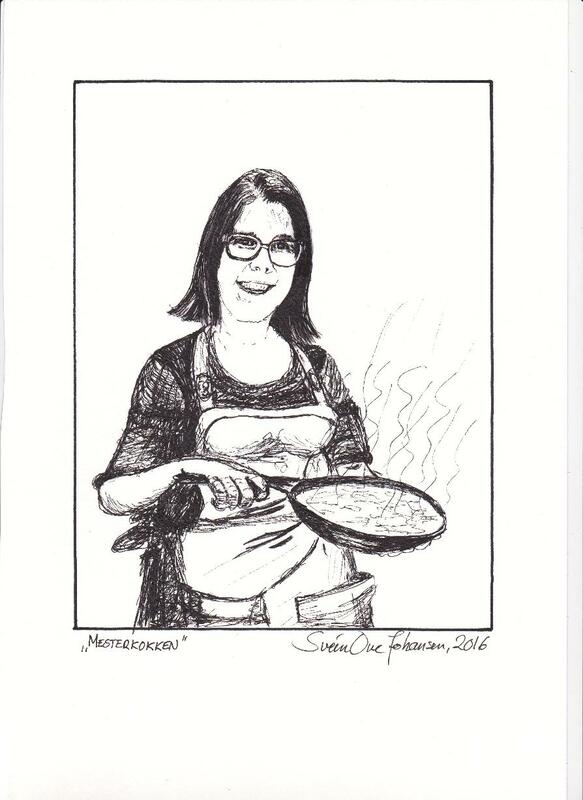 When our friend Nora bought a new apartement and we were invited to her move-in party, I made this picture for her as a gift to her new house. 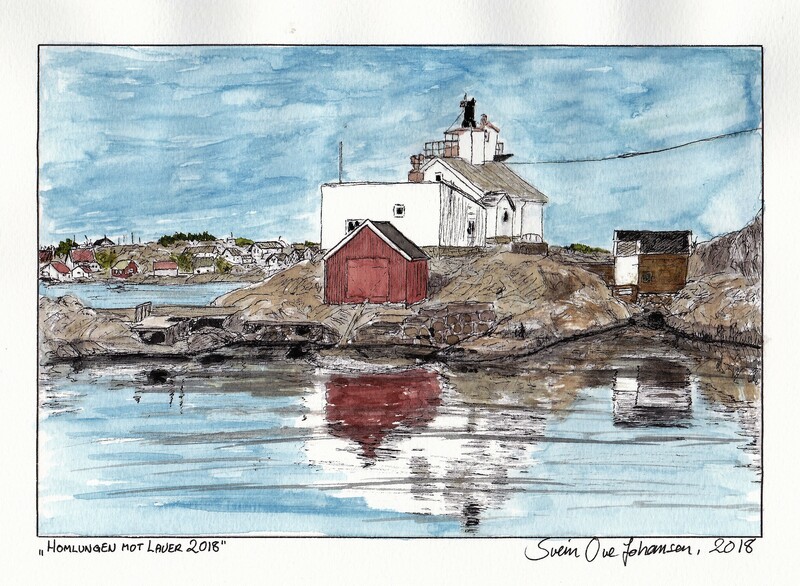 When a friend of ours asked if I could make a picture of this lighthouse placed close to Kristiansand for her husband's anniversery, I came to this result. 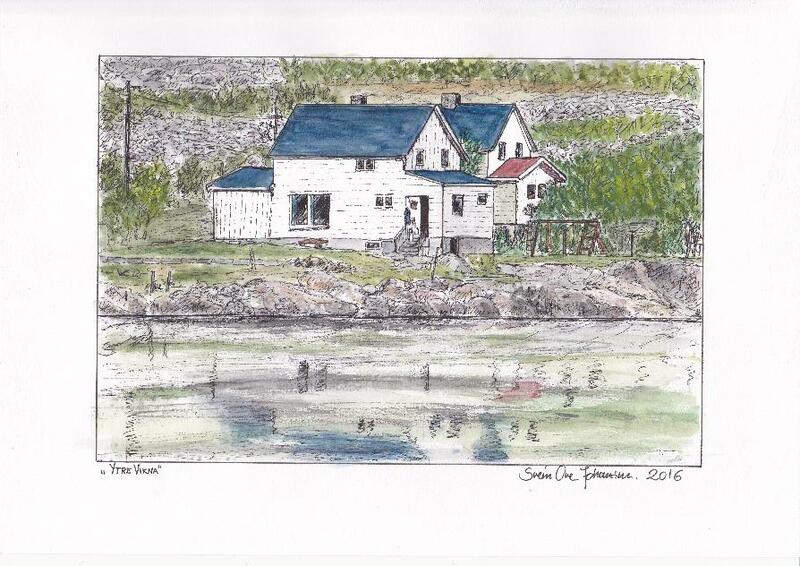 I made this water colour to my dear friend Anne Mette for her 57th birthday. 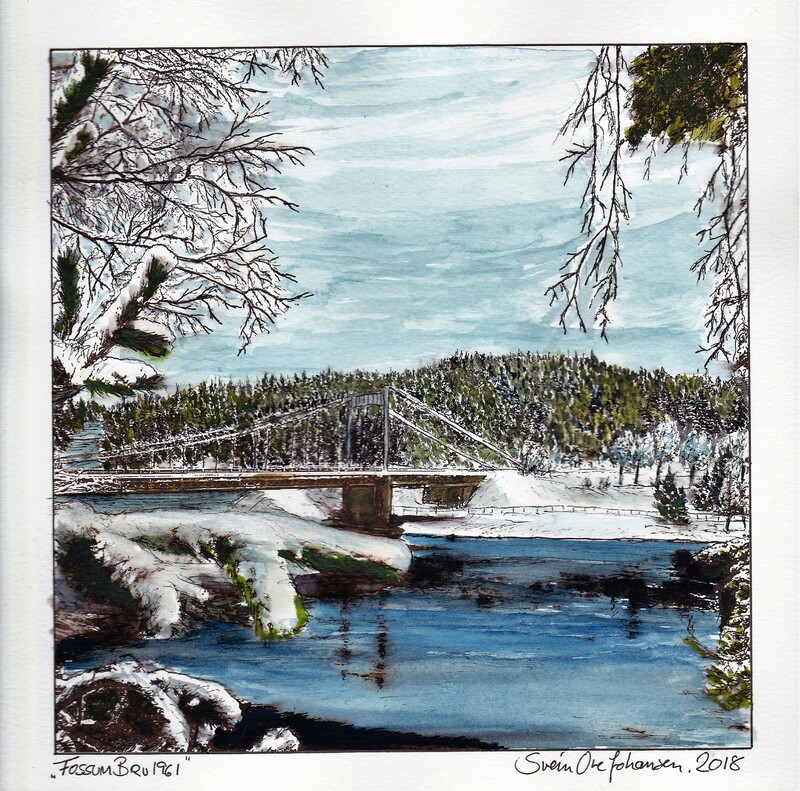 I made drawing "Sørby Brigde by the Bunnefjorden" to a former colleague's 60th birthday. 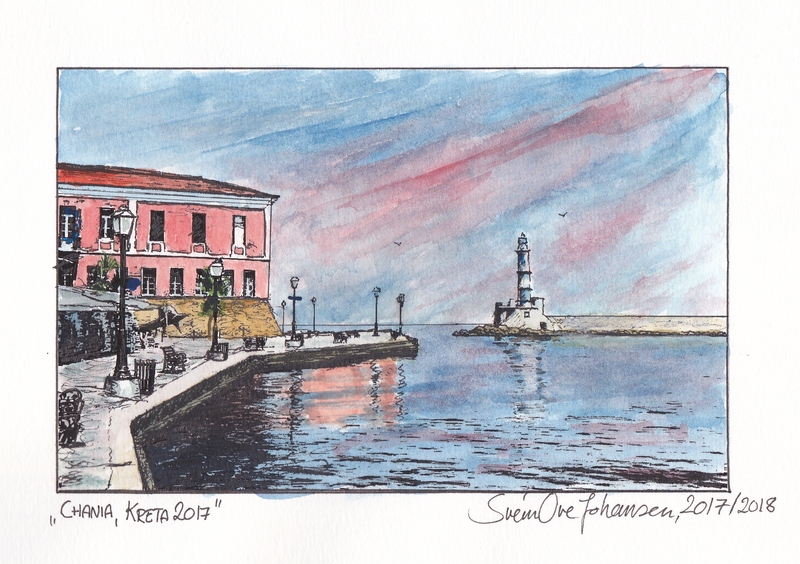 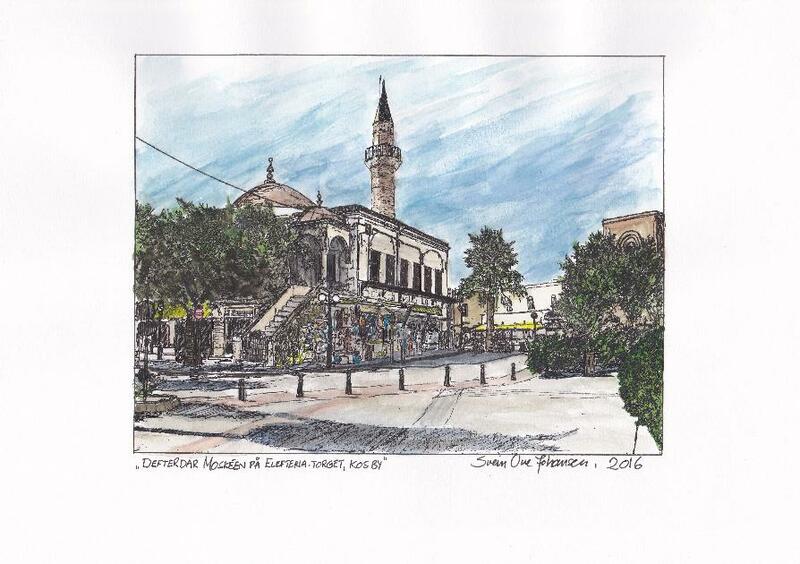 We had a wonderful vacation at Kos in Greece in July, and I made these two water colours from our trip there. 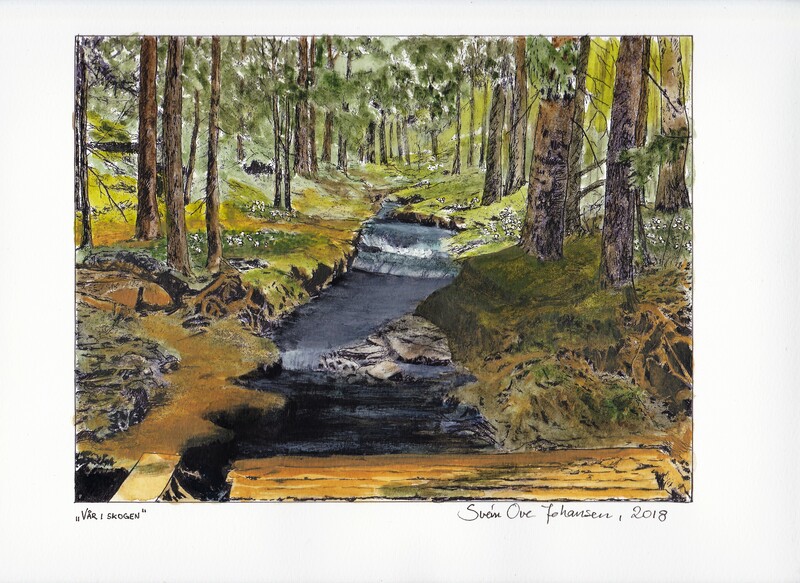 The lake Langen, nearby where we live, has given us much pleasure over the years. 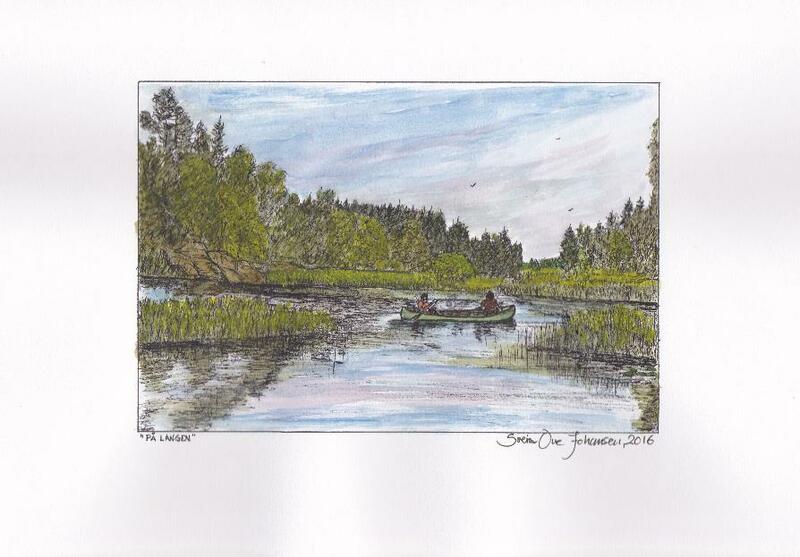 Before I got ill, we often used our canoe on this lake, a memory which inspired me to make this water colour in July 2016. 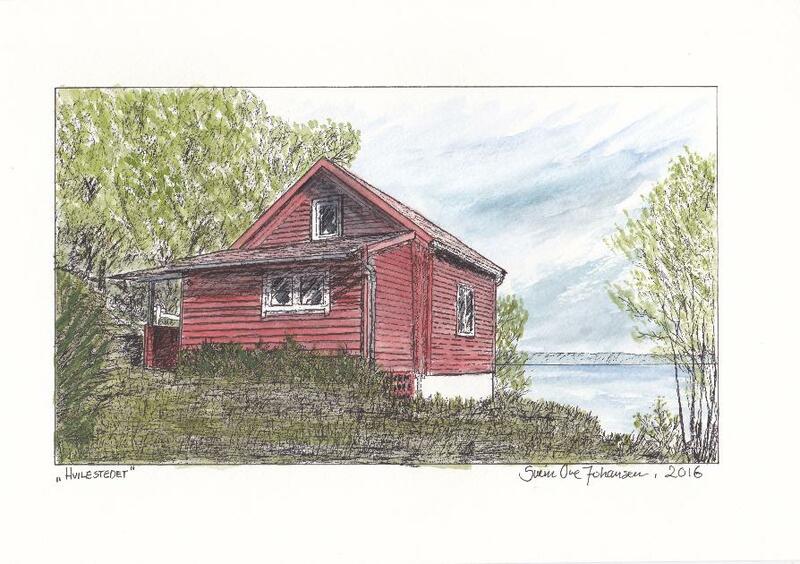 This cottage belongs to a former colleague and friend of ours, and I made the water colour for her at her retirement. 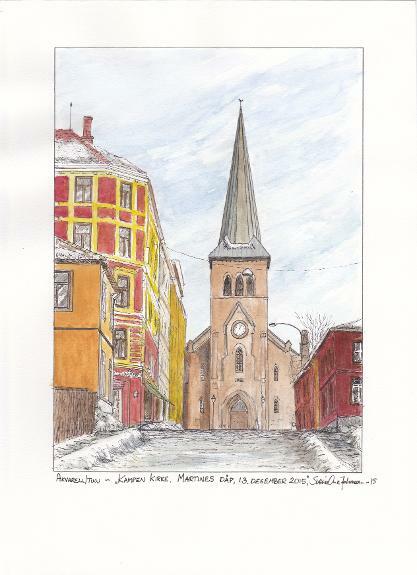 This is my second attempt of painting winter in the mining town Røros. 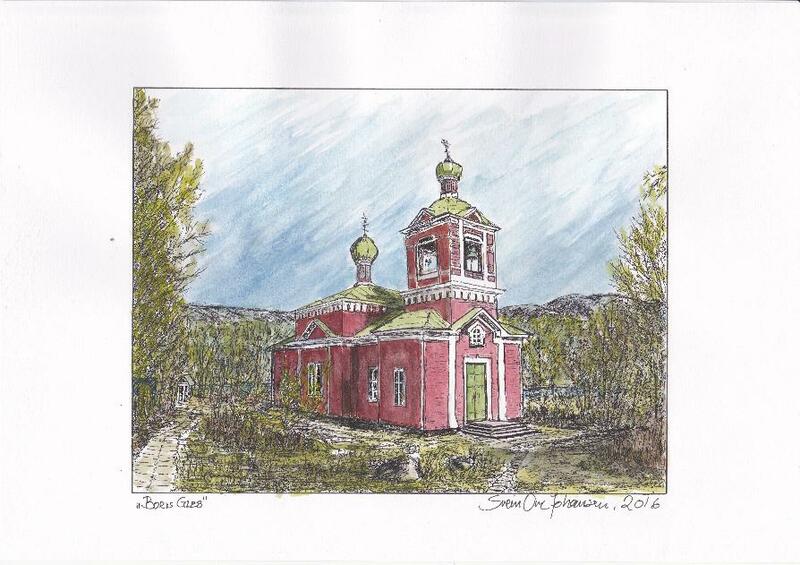 The small chapel of Boris Gleb on the boarder between Russia and Norway is an exiting motive. 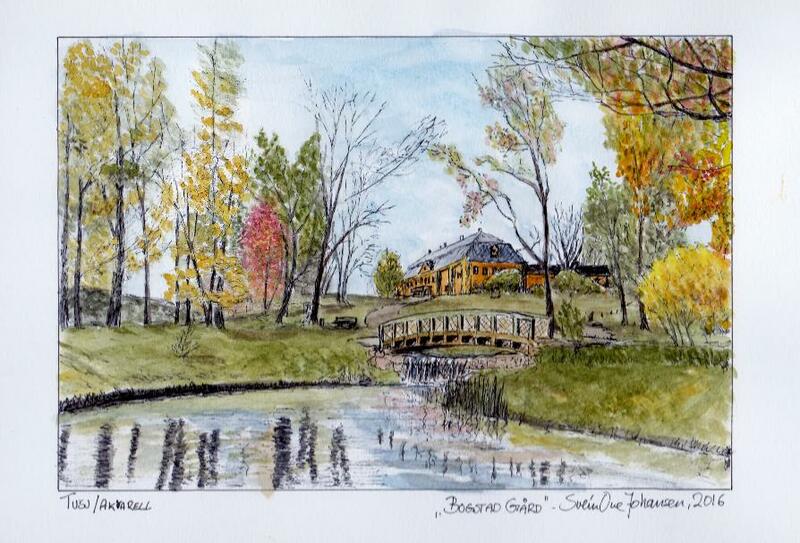 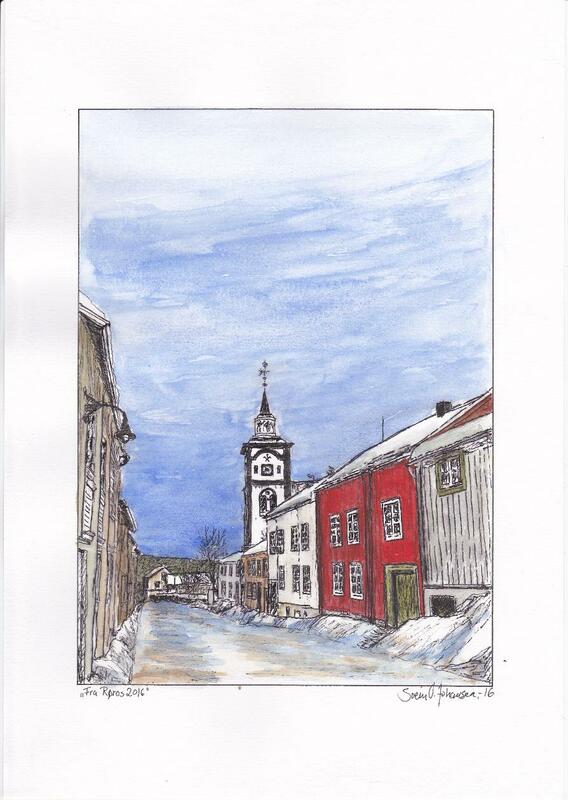 Randi's aunt runs 75 years in October 2016, and I made this water colour of a nearby landmark, the Bogstad gård, for her. 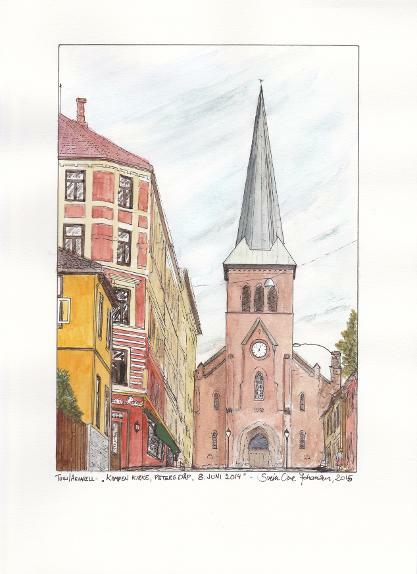 I made this water colour of Bogstad gård in August. 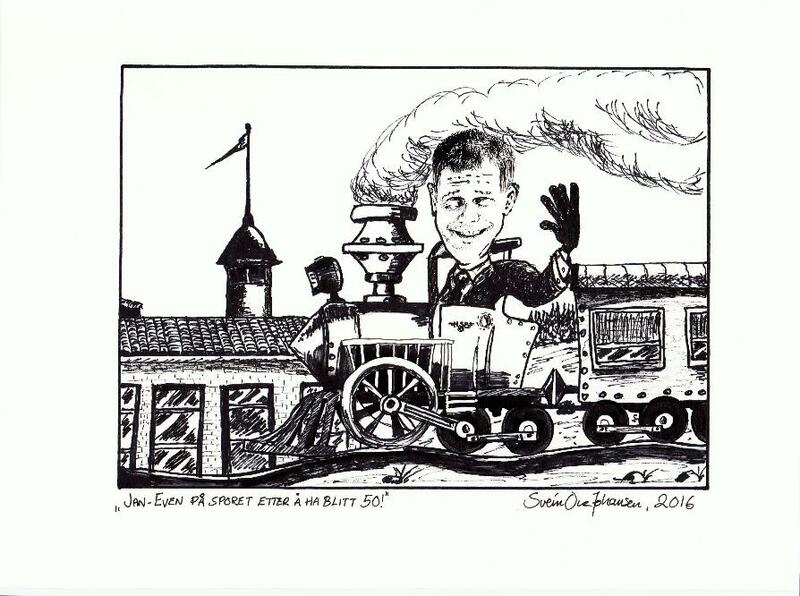 My cousin Jan-Even aged 50 in May, and I made 2 pictures for him. 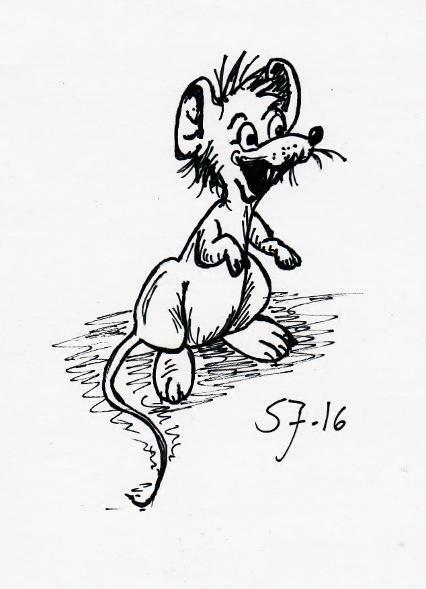 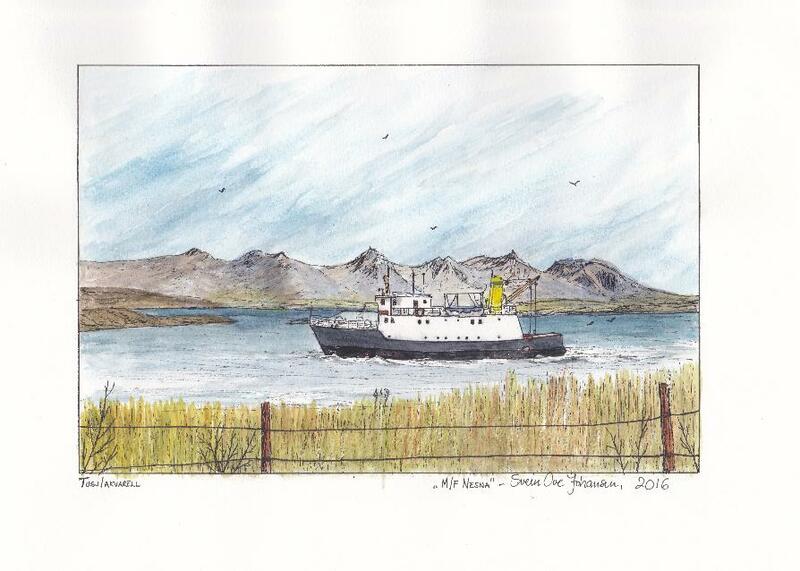 The first ship he worked on "M/F Nesna" & a cartoon. 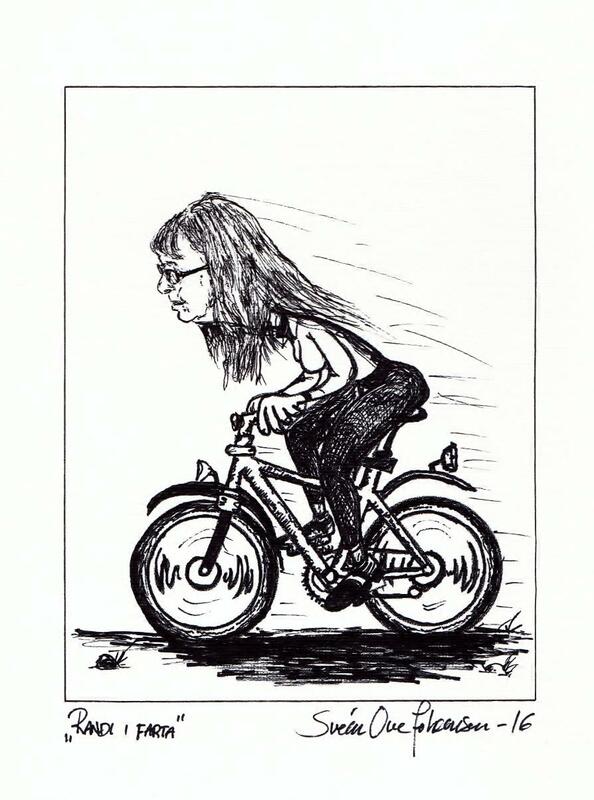 Over: My wife Randi, my daughter Hilde and my son Gunnar as I made my cartoons of them. 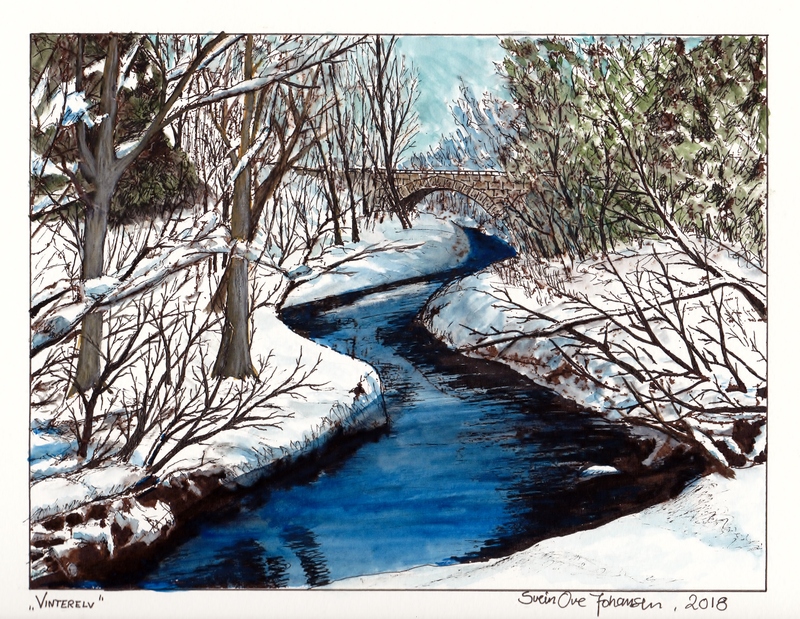 one variation of the motive in winter and one in summer. 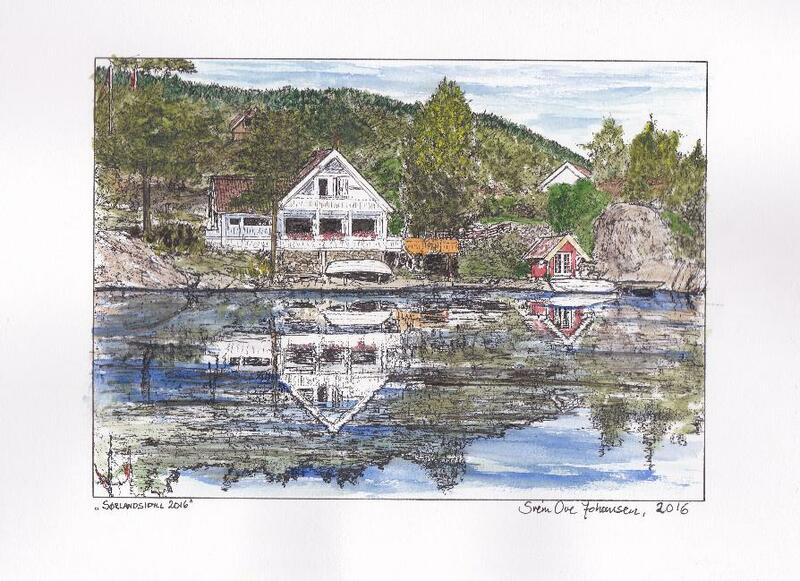 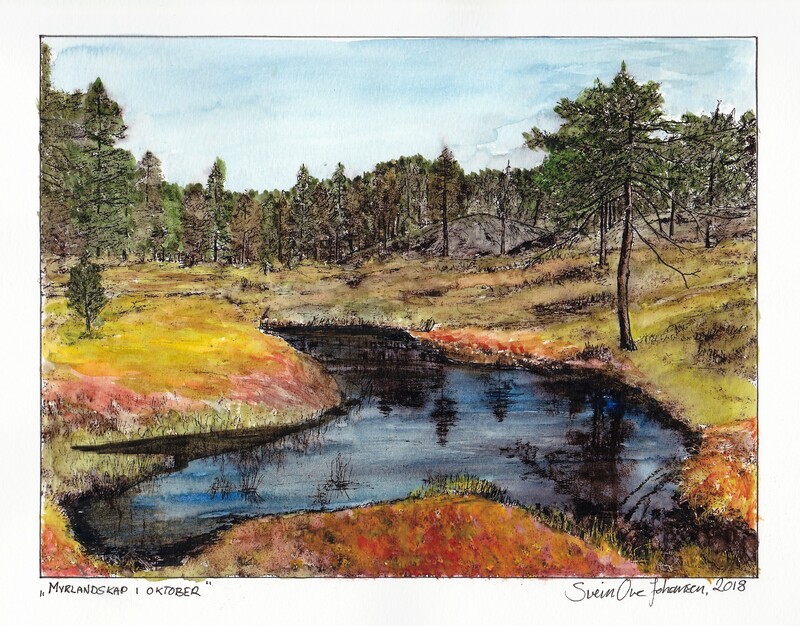 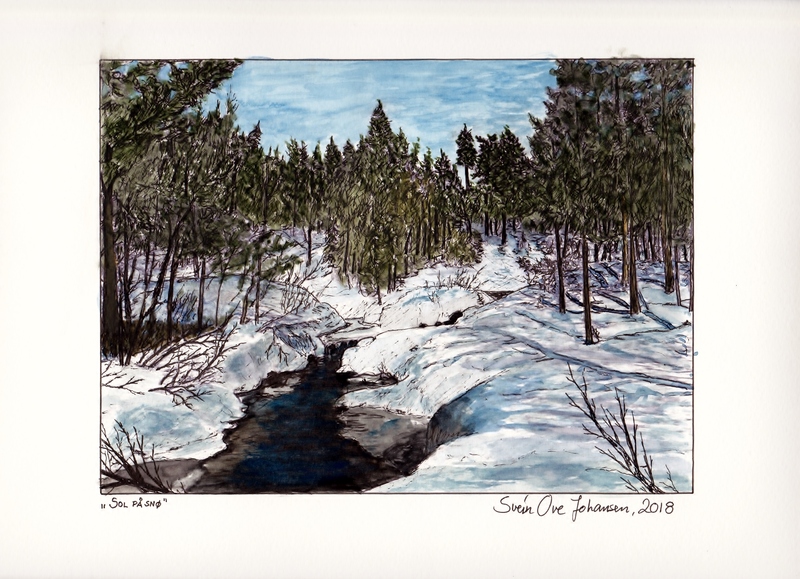 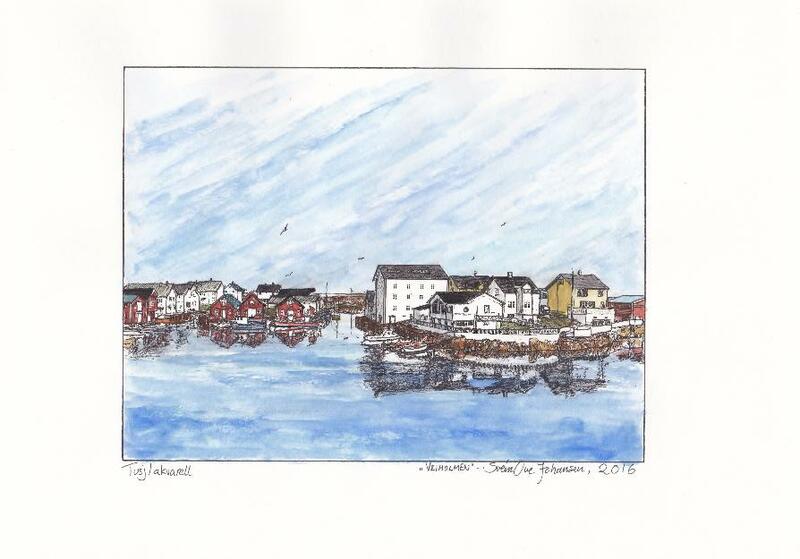 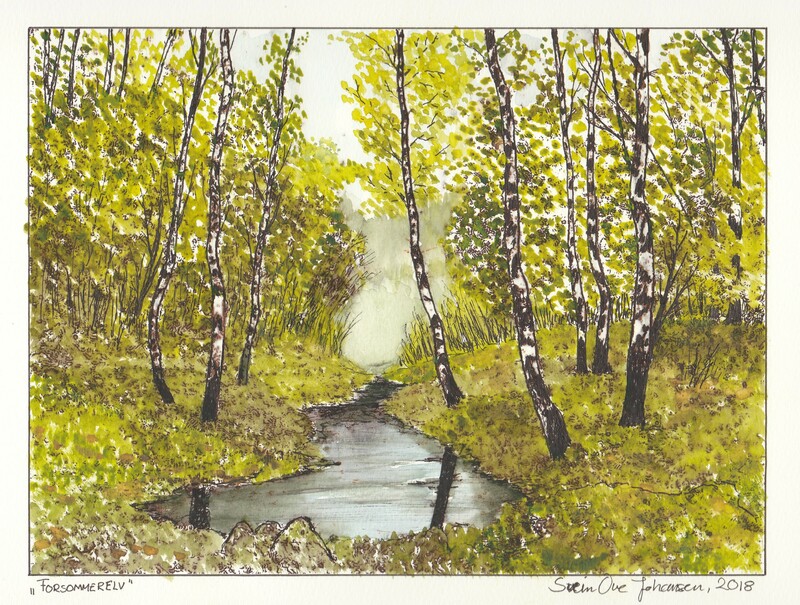 This water-colour is of the small place on the Norwegian west coast, Veiholmen. 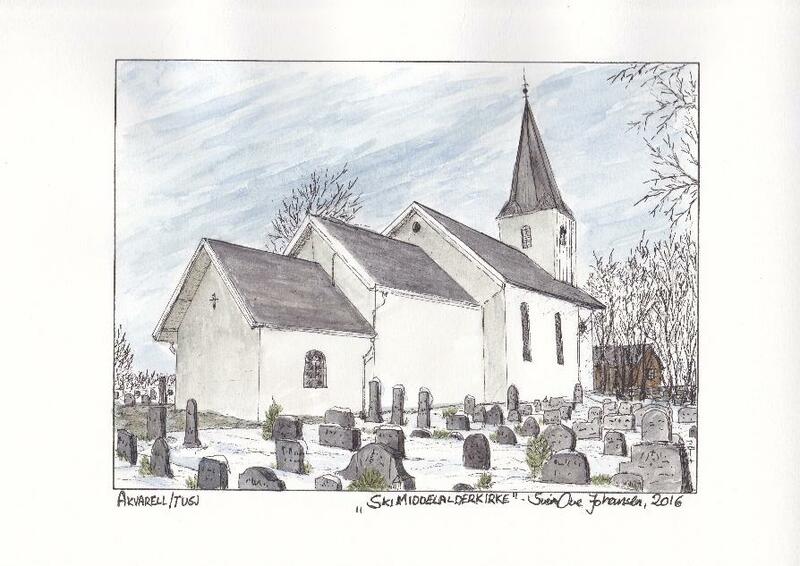 I made this water-colour of our Medival Church of Ski in winter. 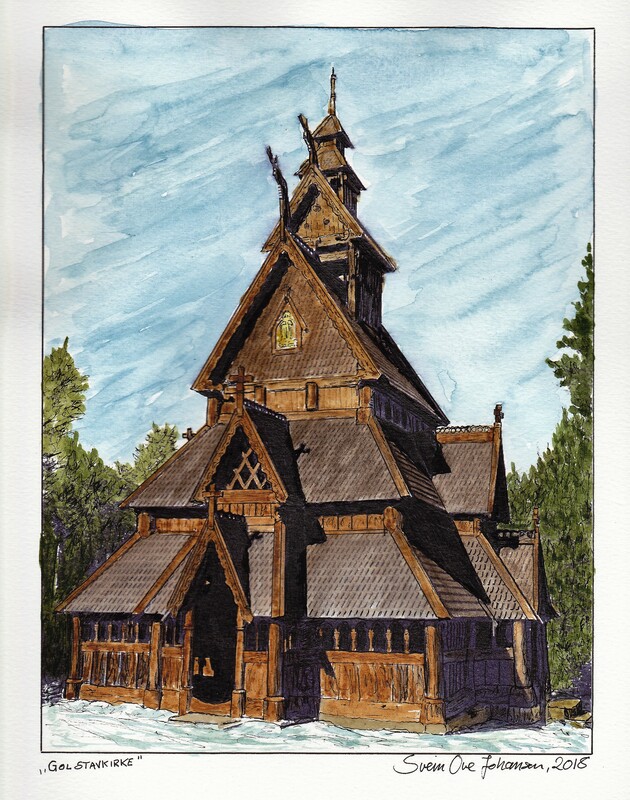 I made this water-colour of our Medival Church of Ski in summer. 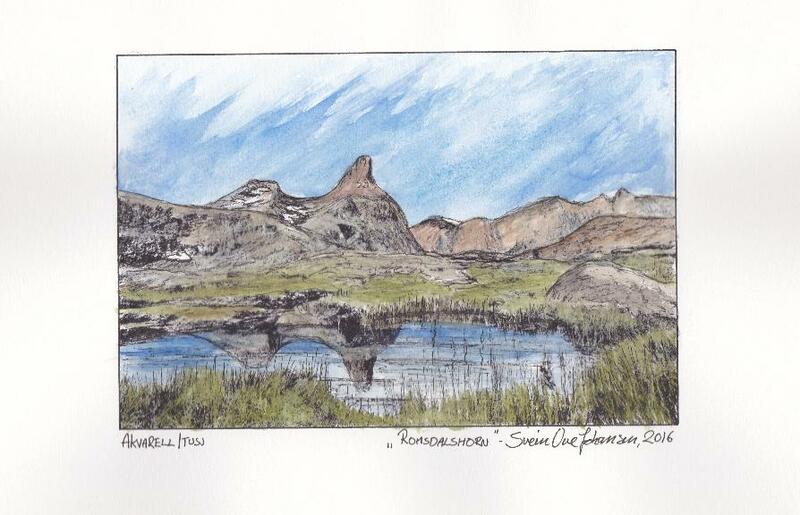 This water-colour is of the mountain Romsdalshorn on the west coast of Norway. 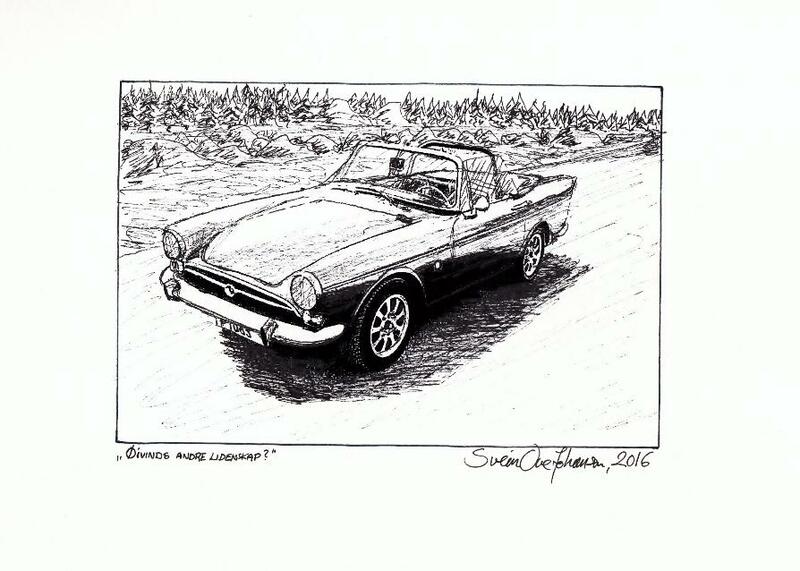 This drawing is of an old car own by a friend of mine. 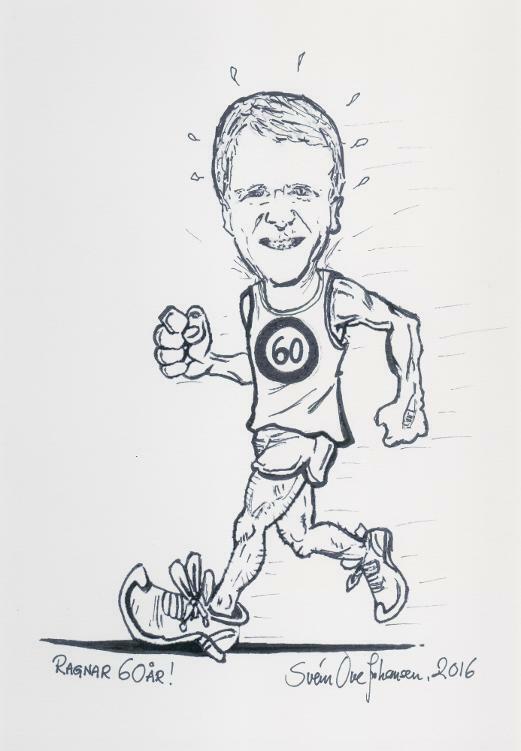 My brother-in-law Ragnar had his 60th Birthday and I made this cartoon of him. 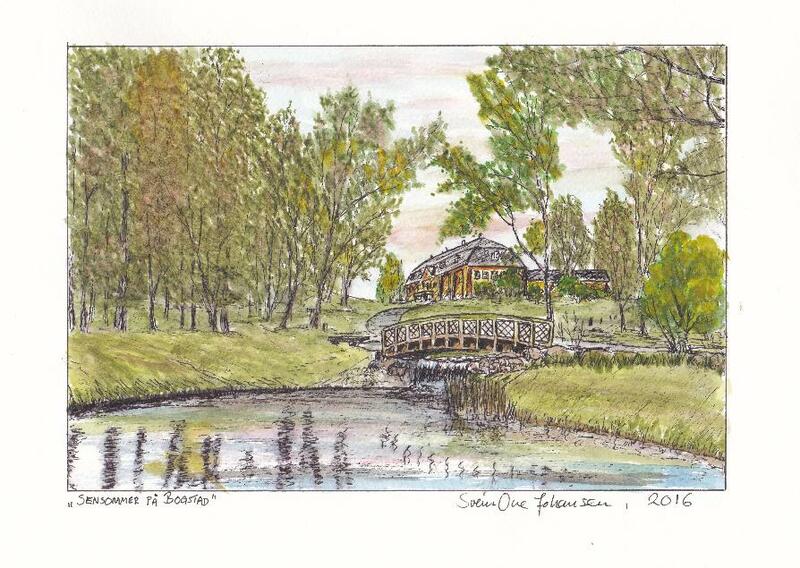 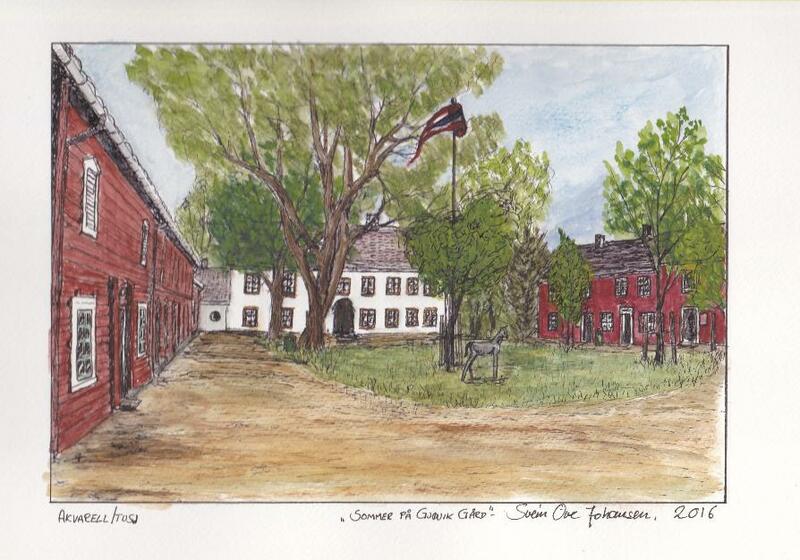 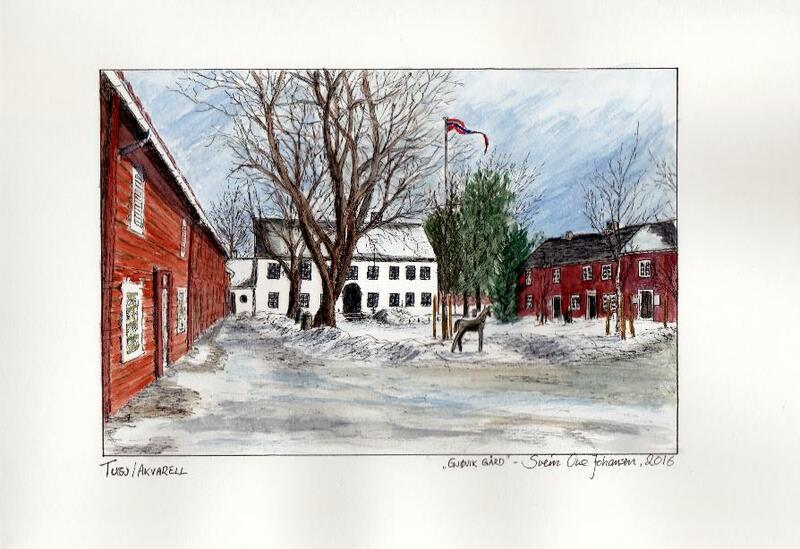 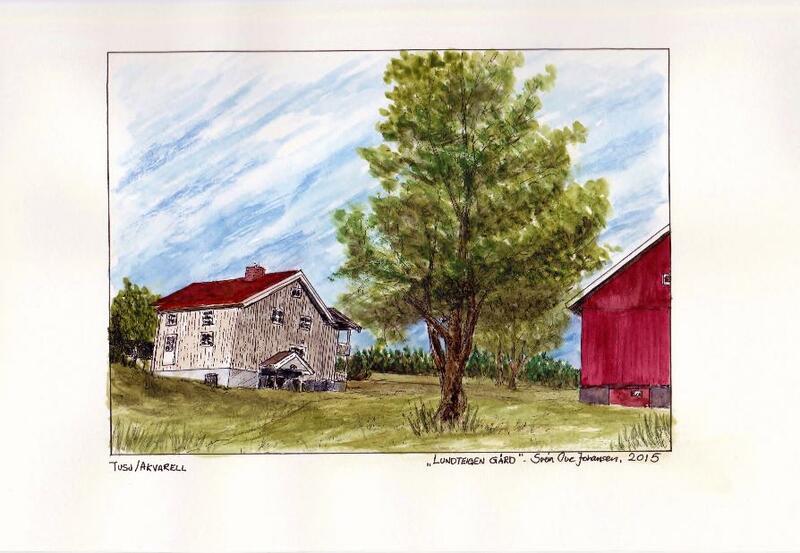 This watercolour of "The Lundteigen farm", I made to my good friend Nina for her 50th birthday. 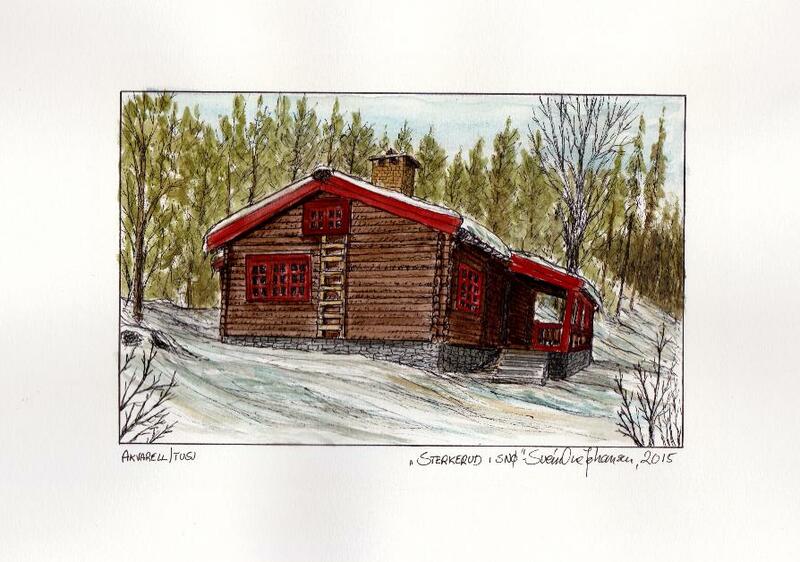 The watercolour "The Scout Cottage Sterkerud in snow" I made as a birthday gift to my friend Stian on his 22nd birthday. 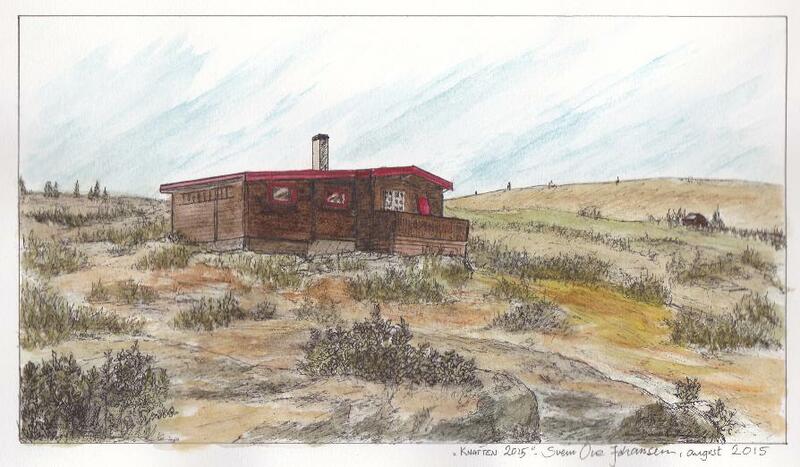 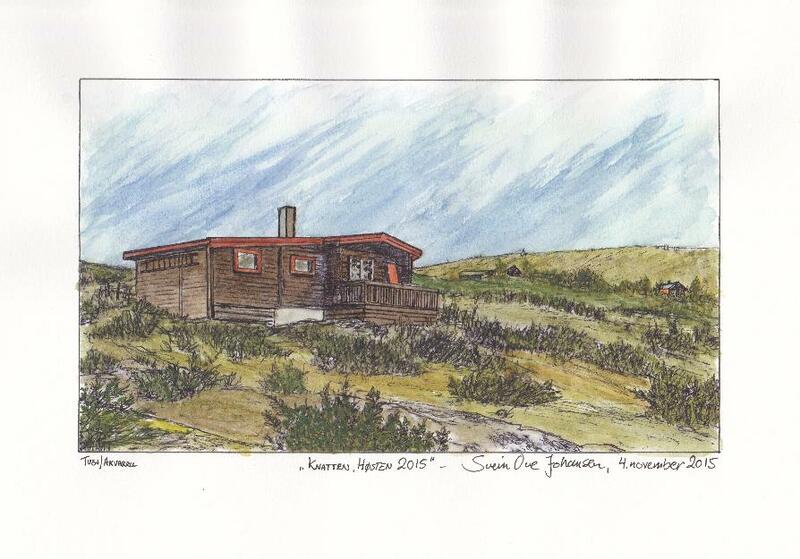 Here I have made two pictures of my sister's and brother-in-law's cabin "Knatten" located on the mountain in Torpo. 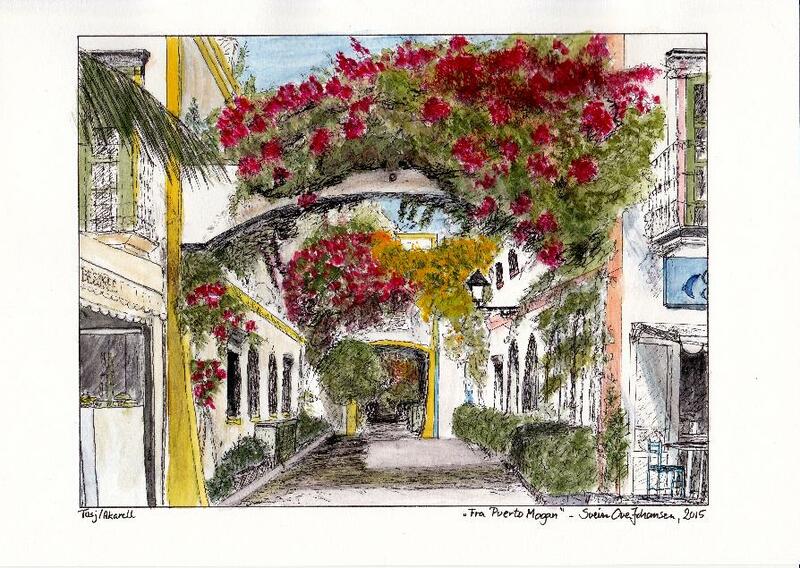 This is the third picture I made from beautiful Puerto Mogan. 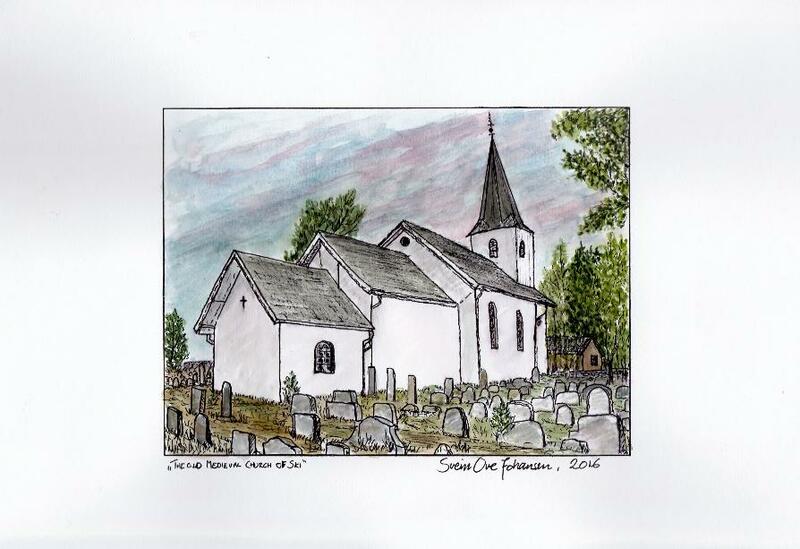 As christening gift to my nephew and niece who were both baptized in Kampen church, I made these watercolours. 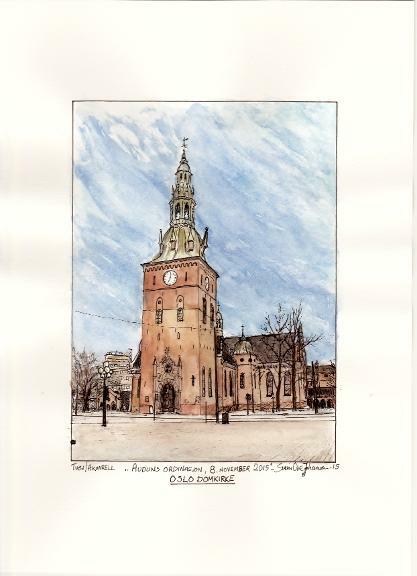 In connection with my nephew Audun was ordained a priest in Oslo Cathedral, I made this watercolour. 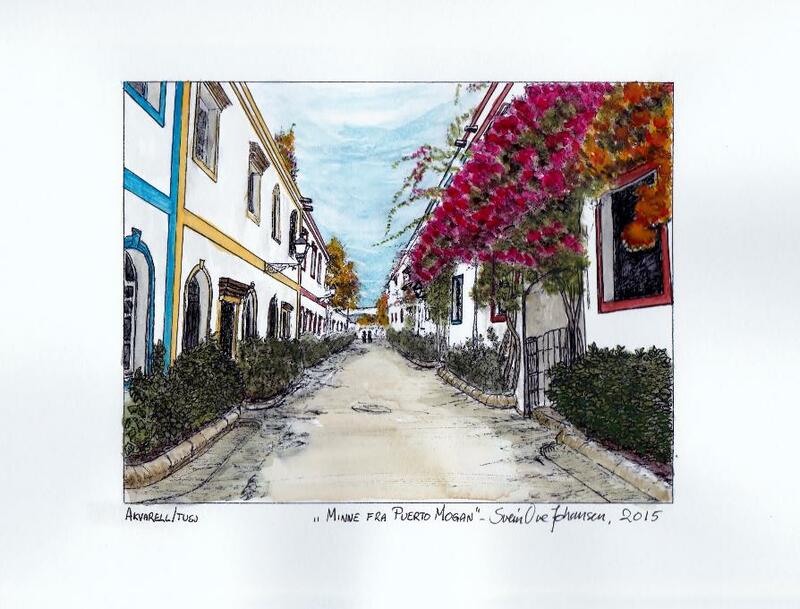 This picture of beautiful Puerto Mogan I made first in acrylic, as you can see below. 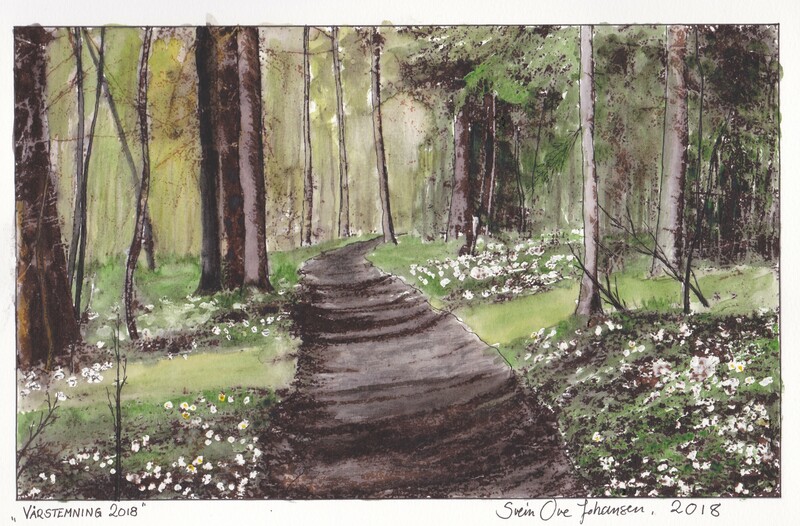 Now I have used the same design as watercolour, and here is the result. 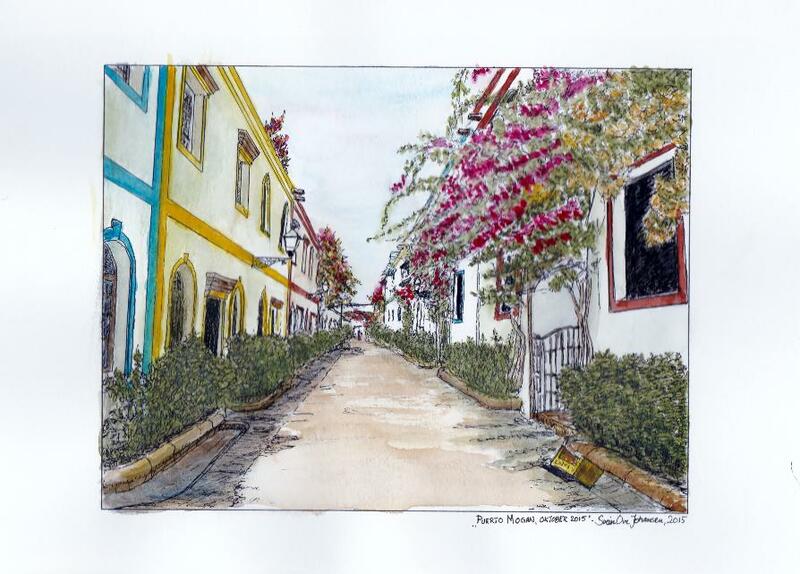 During our autumn holiday this year, we borrowed Ingrid's and Ragnar's apartment in Arguineguin on the Gran Canaries Island. 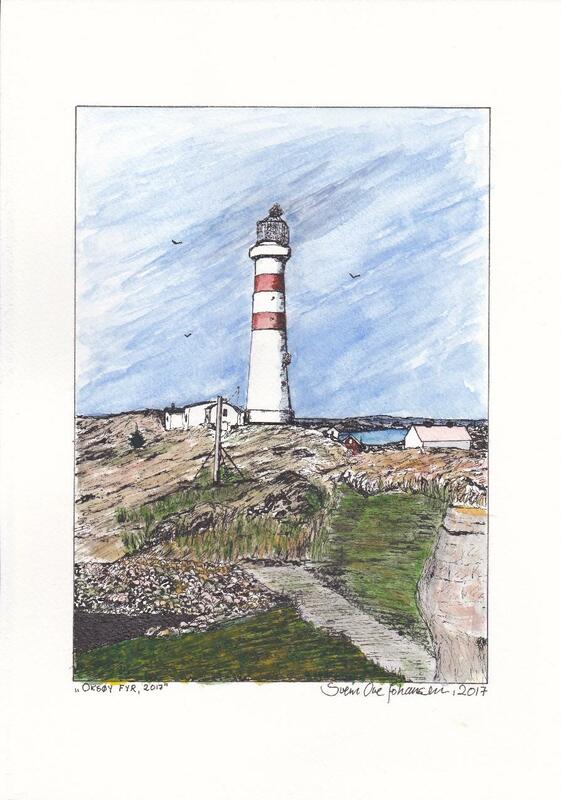 In this connection I made a sketch which formed the basis of this image in acrylic from "From Puerto Mogan". 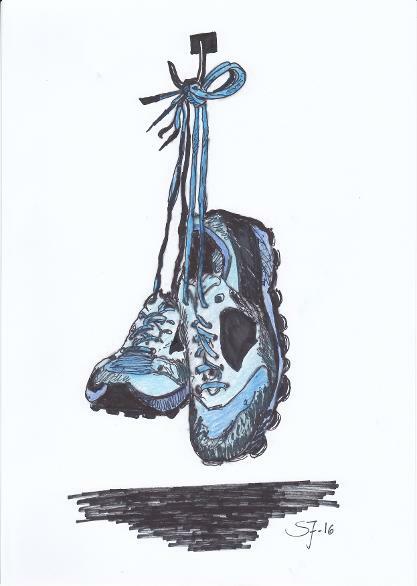 It is now hanging on the wall in our bedroom. 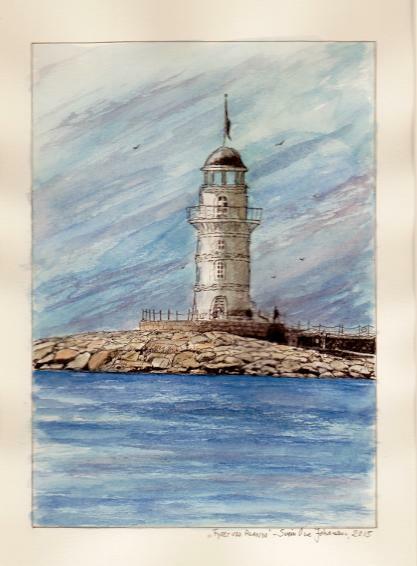 This watercolour, "The lighthouse at Alanya", I painted in August on behalf of my daughter Hilde. 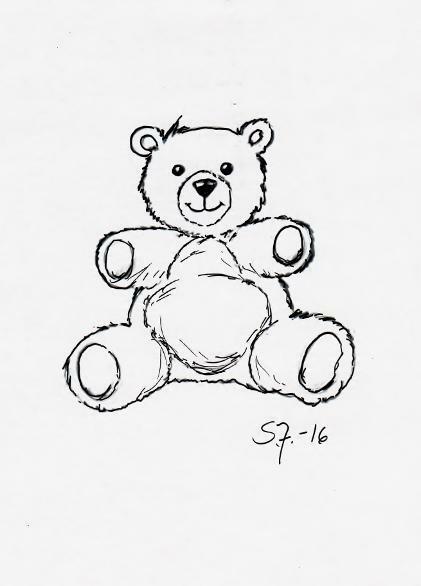 She wanted it as a gift to some of her friends. 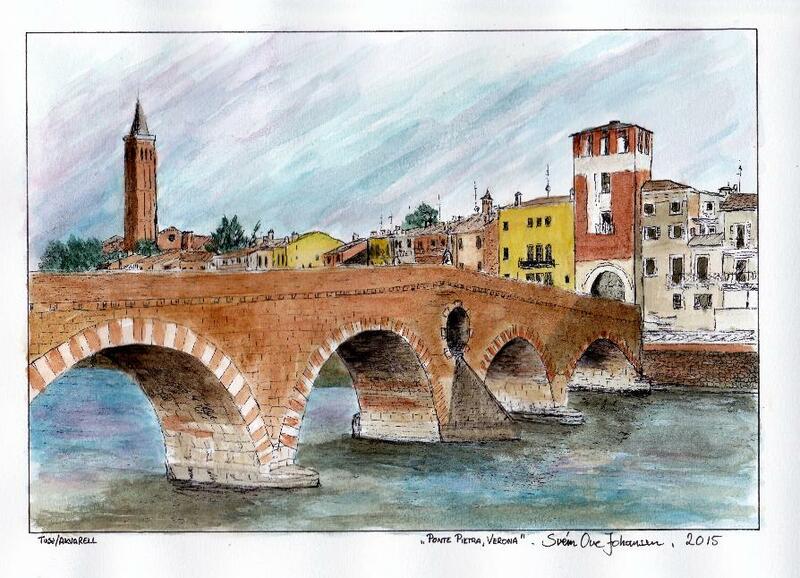 After Italy trip in March to Verona with Ski Janitsjar (in which Randi participates in), I was inspired to paint some of Verona to have our kitchen wall, which resulted in the painting in acryl; "Ponte Pietra, Verona". 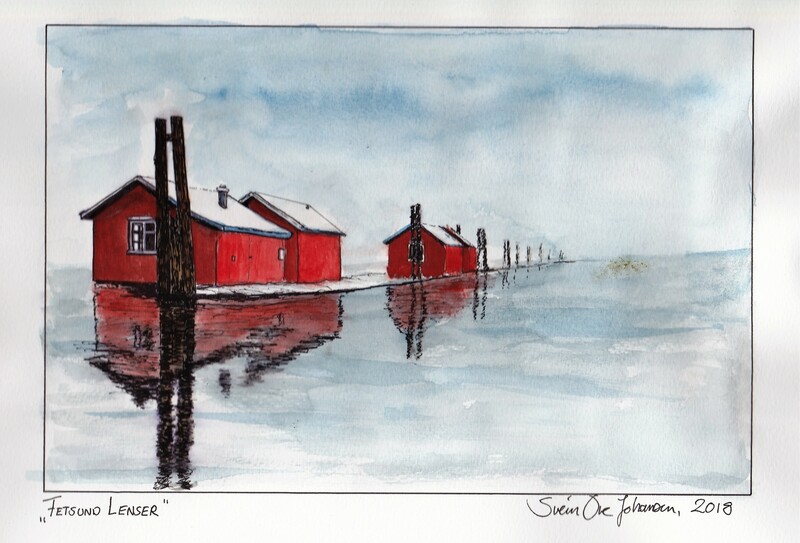 When our friends Silje and Ole Kristian chose to marry this summer, it was natural to paint a watercolour of the same design to the wedding feast their since both Silje and Ole Kristian also participates in Ski Janitsjar and were together with us on that same trip. 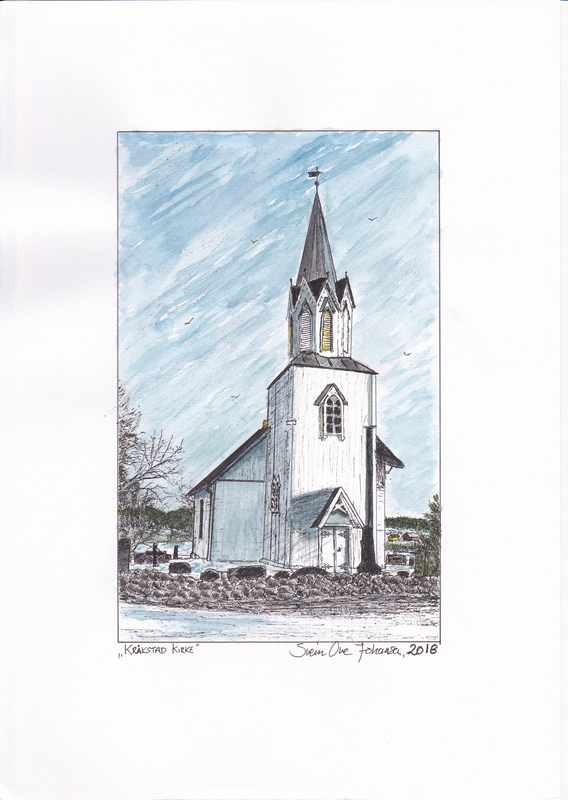 When my sister's youngest son, Espen, celebrated his 25th birthday on June 11th, I wanted to give him and his nice fiancé Stine something special. 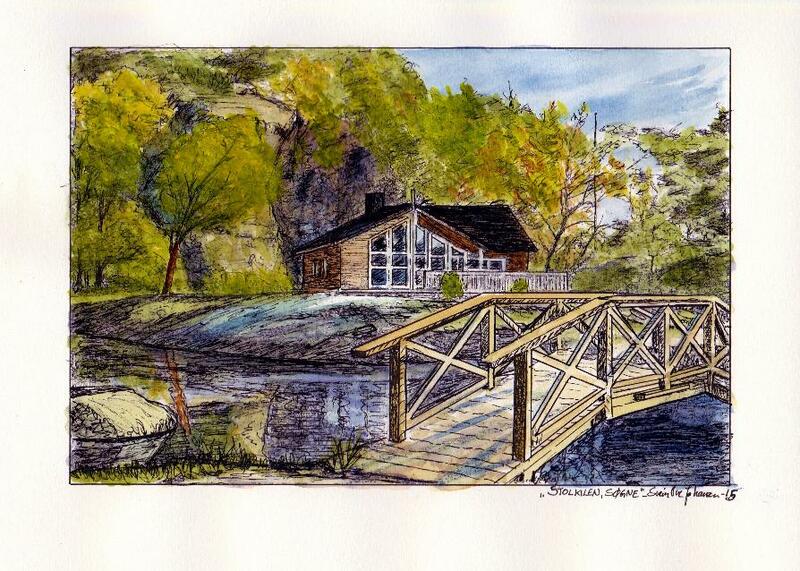 Besides, they had just bought a new property in Vestby. 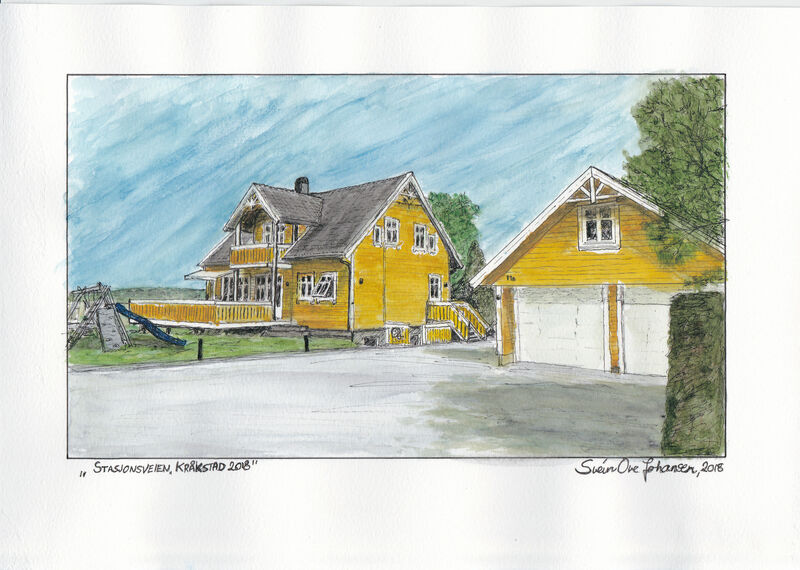 I made this watercolour of "The cottage Stolkilen in Søgne" after an image they had put on Facebook for them. 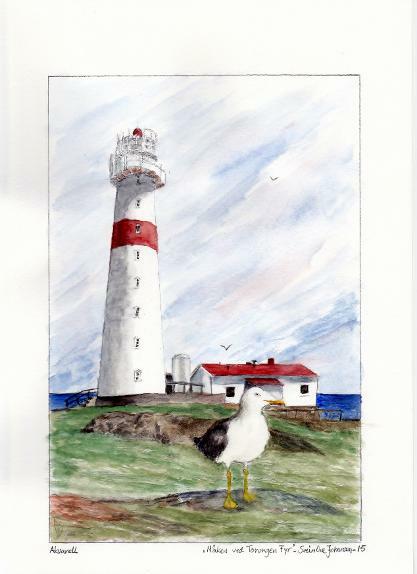 This watercolour, "The Seagull at Torungen Lighthouse," I painted in May on behalf of my nephew Håvard and his wife Kirsten who lives in Arendal. 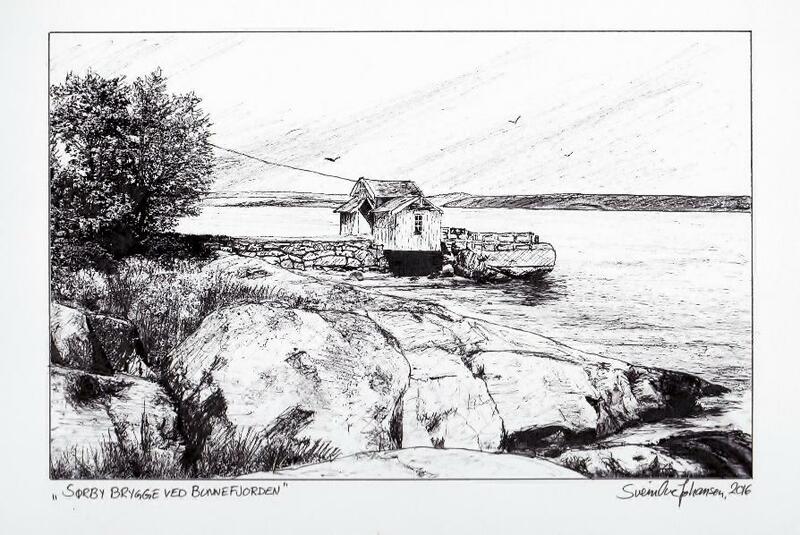 This was a task I enjoyed very much because my dear uncle and in many ways my first mentor, Mikael Jørstad, was born precisely here and grew up looking at Torungen. 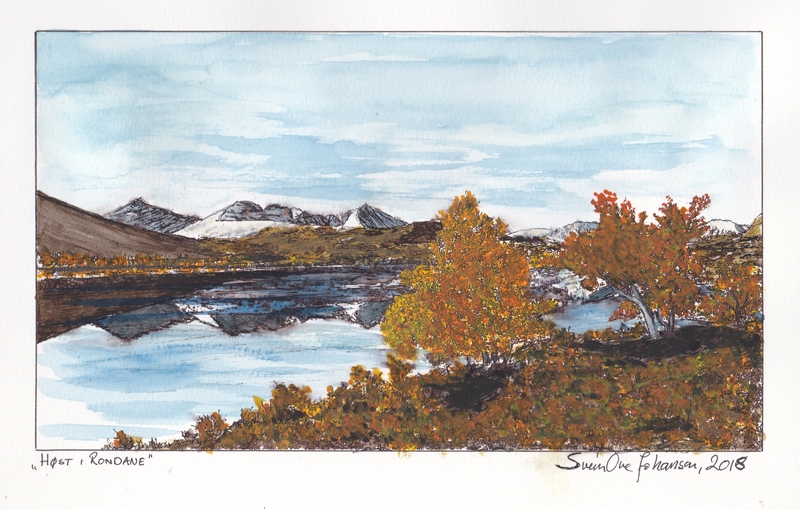 In addition I love the South Coast of Norway after living for here for almost ten years in the area, and it all made sure it was a pleasure to make this picture. 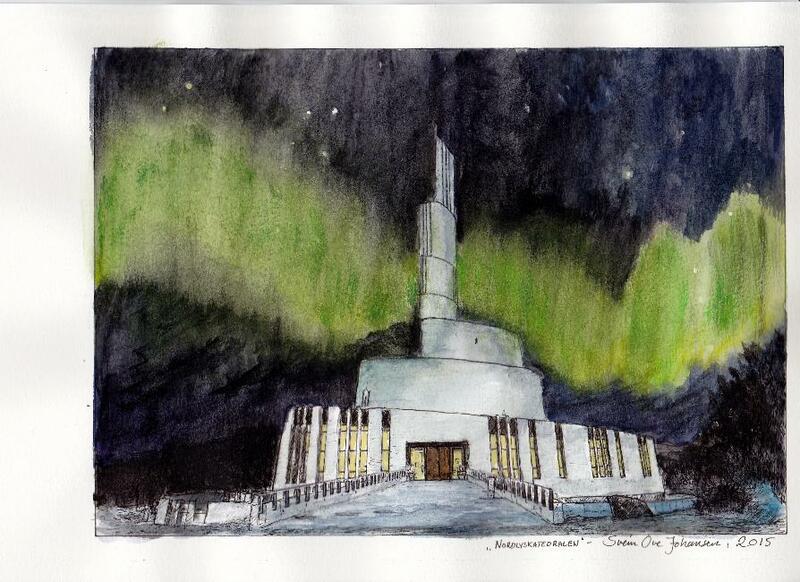 "Northern Lights Cathedral" in Alta in the Northern part of Norway. 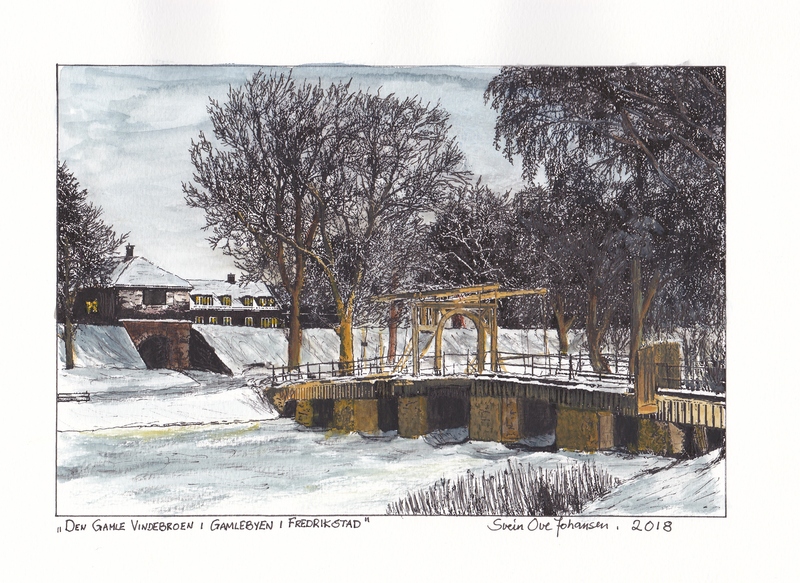 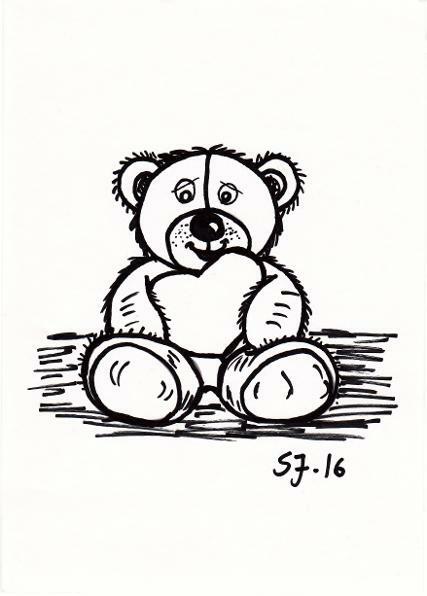 - (Markers / watercolour in 2015)It was a quite challenging task to come by, a challenge made by my good friend and sister-in-law, Ingrid. 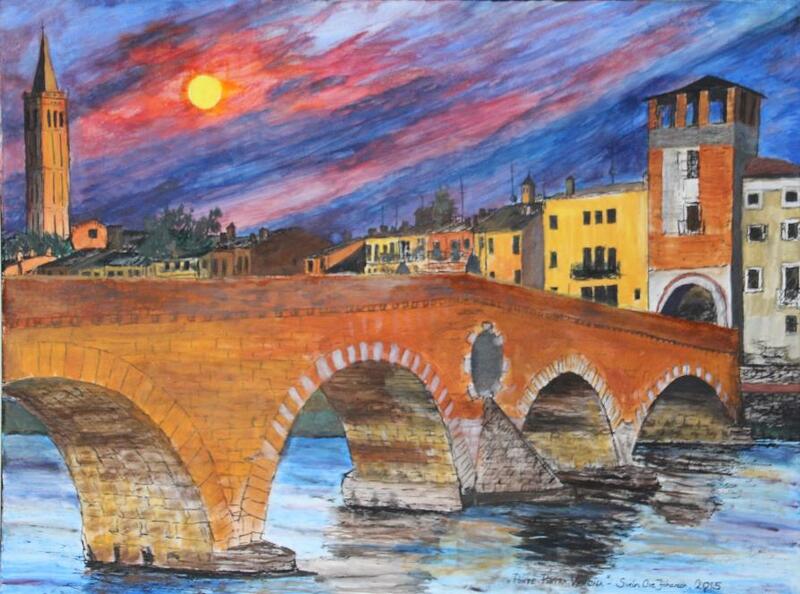 After our Italy in March trip together with my wife Randi, I was inspired to paint some of Verona to have the kitchen wall, which resulted in this painting made in acrylic on large canvas (60 x 80 cm), "Ponte Pietra, Verona". 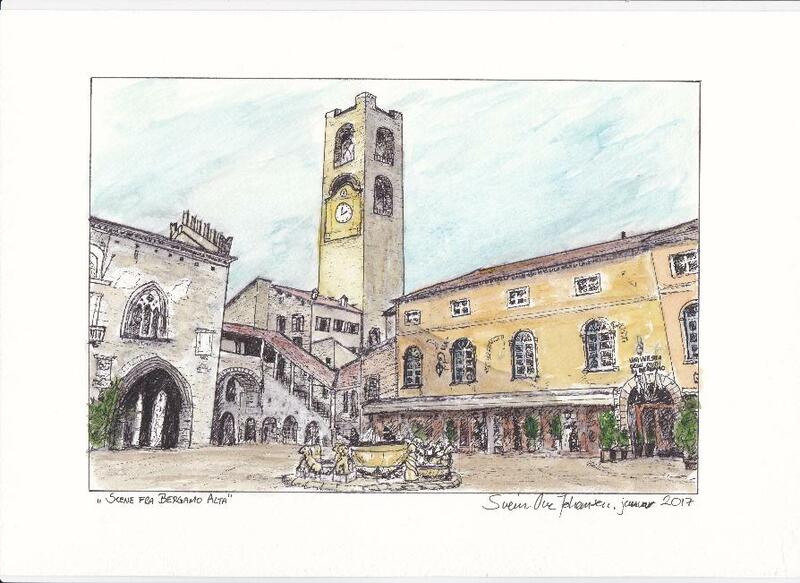 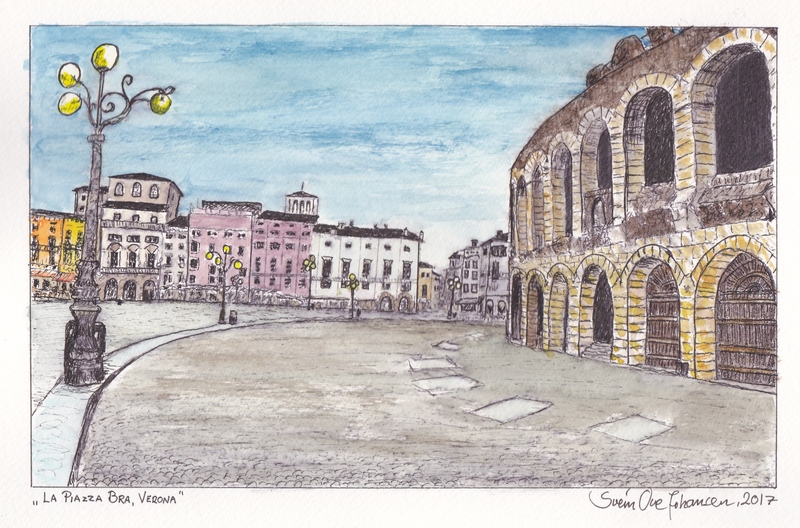 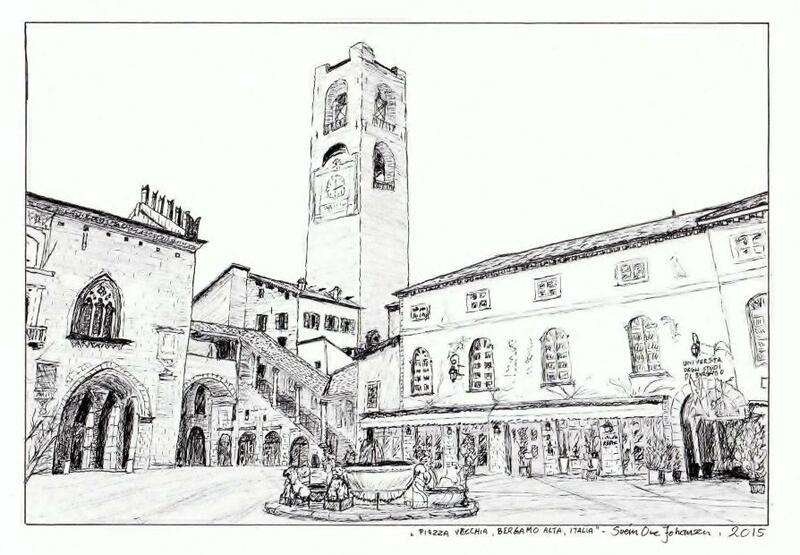 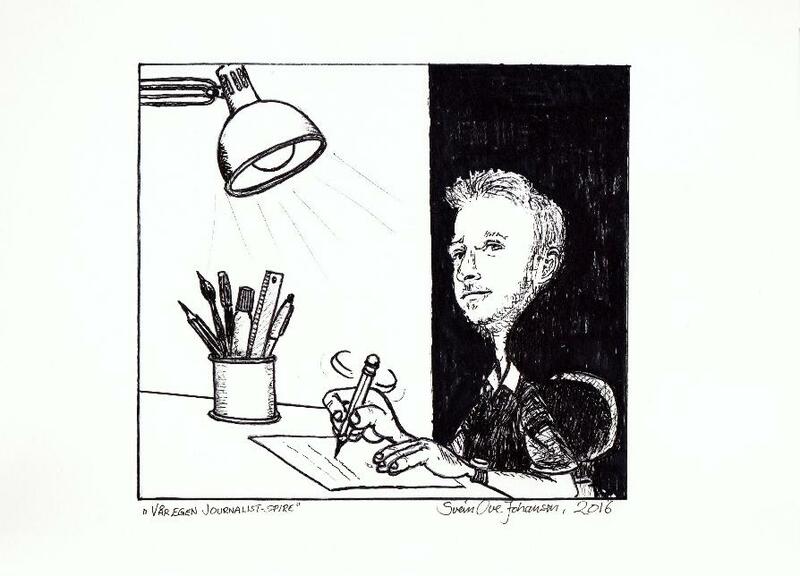 When I went to Italy with Randi's band, Ski Janitsjar, in March 2015, I made this pen drawing to our eminent, fantastic conductor, Geir Aage Sveen, taking the motive from the sightseeing trip to Bergamo, and called the drawing "Piazza Vecchia, Bergamo Alta, Italy." 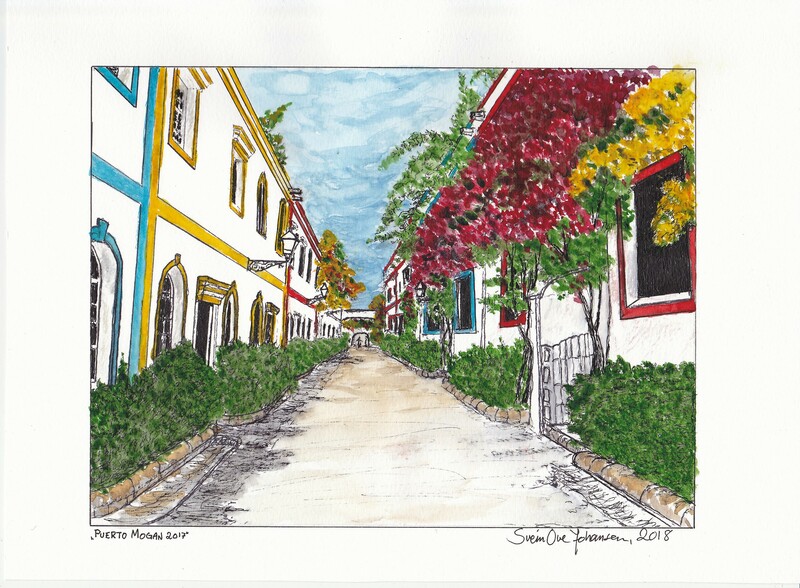 I also painted the motive "Puerto Mogan" in acrylic on large canvas (60 X 90 cm), and the result is here. 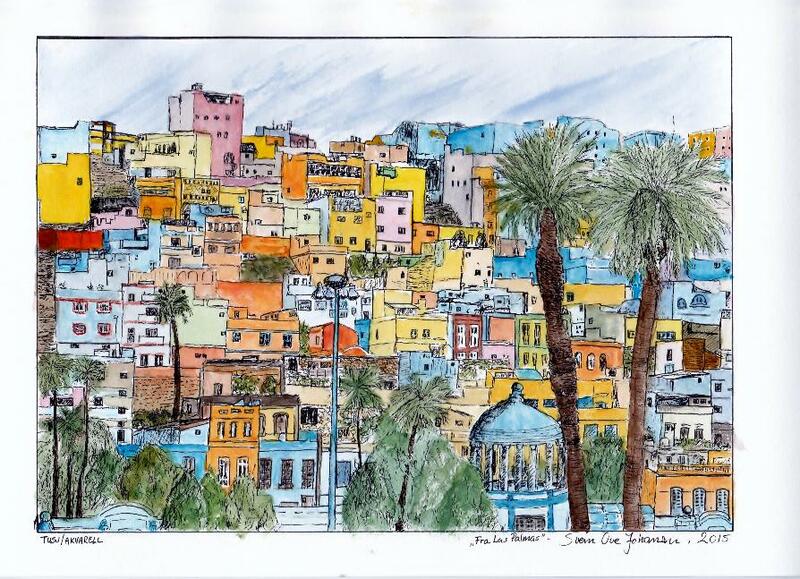 "From Puerto Mogan" and "From Las Palmas" - (Markers / watercolours) I made these pictures in 2015 on behalf of my good friend and sister-in-law Ingrid and her husband Ragnar. 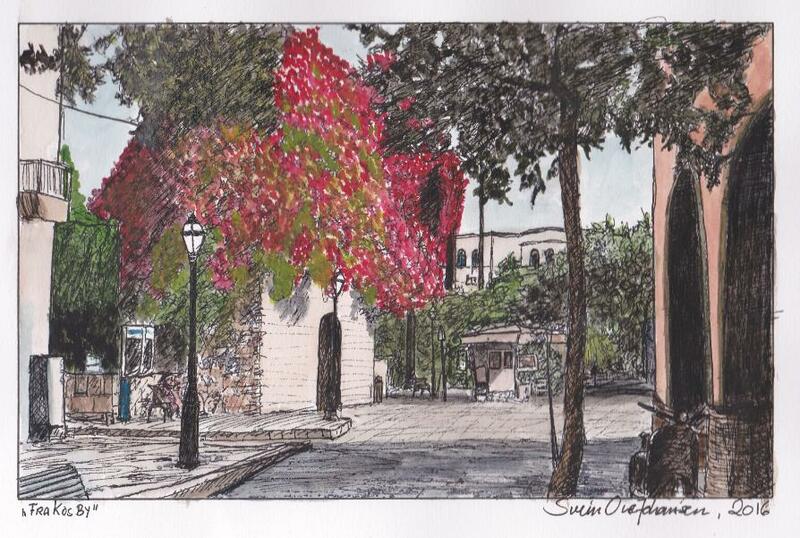 The images are from the beautiful area of Puerto Mogan and from old part of Las Palmas in the Gran Canaries. 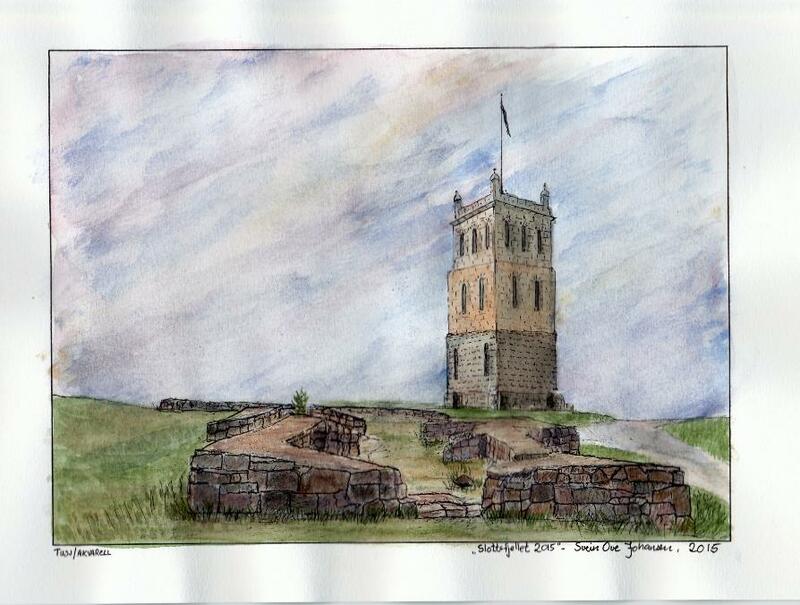 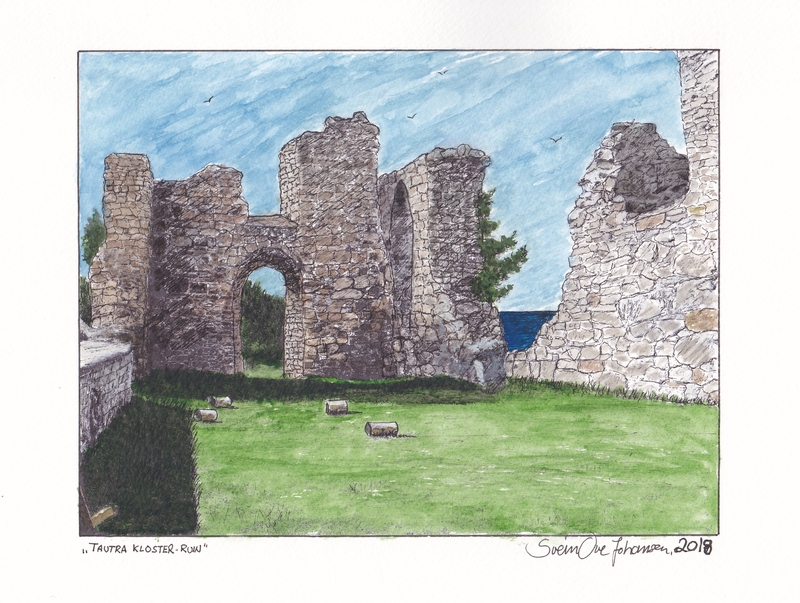 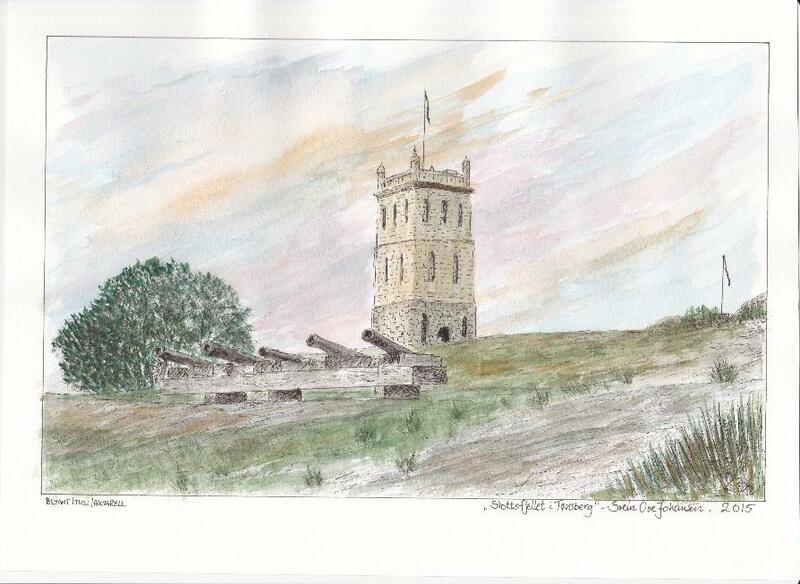 My first two pictures made in 2015, were these two watercolours of the Castle Rock in Tønsberg.